Also known as the Whitechapel Murderer and Leather Apron: serial killer of unknown identity, generally believed to have been active in the largely impoverished areas in and around the Whitechapel district of London in 1888. "Over the course of the Ripper murders, the police, newspapers, and others received hundreds of letters regarding the case. [...] Hundreds of letters claimed to have been written by the killer himself." 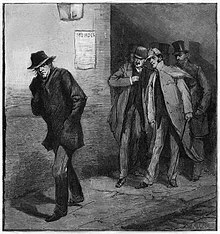 — Excerpted from Jack the Ripper on Wikipedia, the free encyclopedia. "Another London Horror", British Daily Whig (October 02, 1888). "The Whitehall Discovery Inquest Today", St. James Gazette (October 02, 1888). "The Whitehall Murder", The Daily Telegraph (October 03, 1888). "Ghastly Murder in the East-End" (1888). "The Latest Murder", Olean Democrat (September 12th 1889). The Lodger, novel by Marie Adelaide Belloc Lowndes (1913). This page was last edited on 25 February 2018, at 16:13.